Some people become well-known in Box both because of their contribution to village life and because their families were significant in developing the traditions of the village. That was true of HH Sawyer, affectionately known as "Bunno". He came from families who were some of the earliest Box postmasters, ran Hardy House as a shop and developed Valens Terrace, discovering on the way the further extent of Box Roman Villa. This is Bunno's story as told by his son, Hugh. My father, Hubert Hardy Sawyer, was born in 1906, the youngest of six children to Francis (Frank) Sawyer and Elizabeth Anne, known as Annie, nee Hardy. 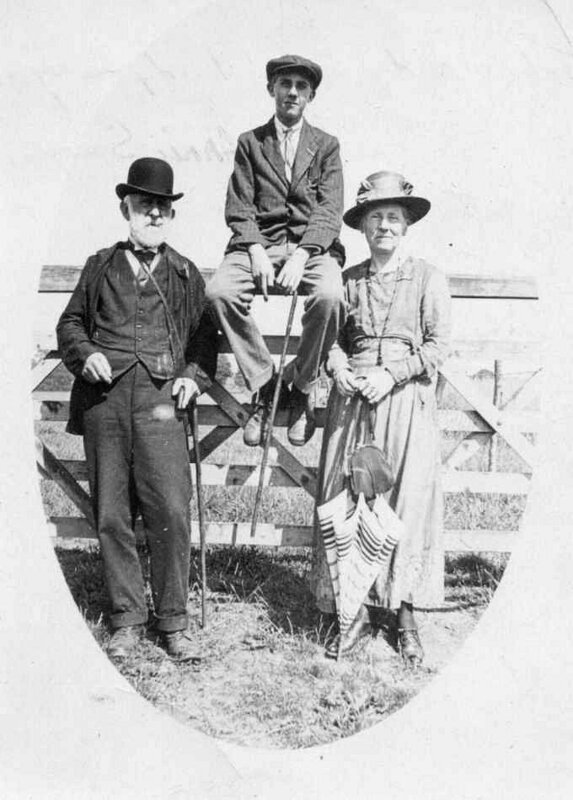 Frank built Valens Terrace for Annie’s father, John Hardy, who purchased the land in 1897, which you can read about at Valens Terrace, where there is a picture of all six children sitting on the roof. They lived for a while in no 2 and after no 1 was built this then became the family home until Annie died in 1961. Hubert’s nickname of Bunno started in his childhood, but remained with him for the rest of his life. It apparently came from a game the children played where they imitated animals, and Hubert was always a rabbit ! (Gilbert was Potto – not sure why !). ​By all accounts, Hubert had a happy childhood in Box. 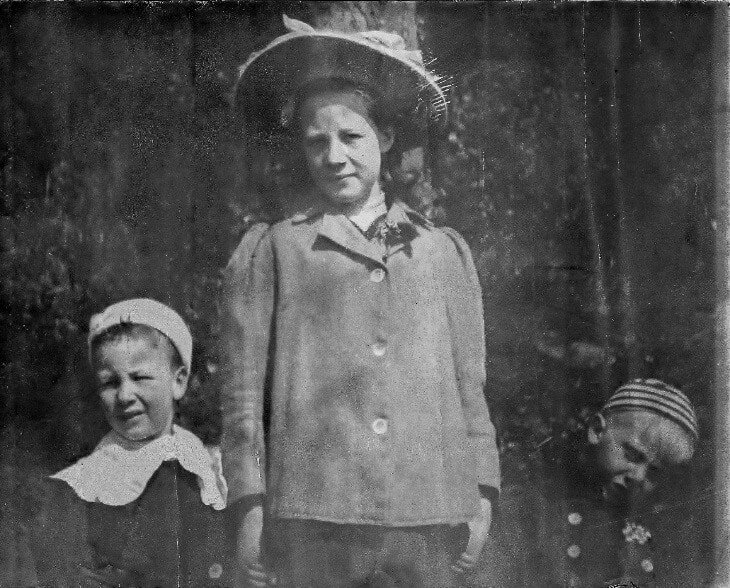 The photograph below left shows him (on the right) with brother Gilbert and sister Amy. The one below right shows him as a choirboy at Box Church from childhood until the 1940s, photographed here with Gilbert in their gowns. The photo bottom left has Muriel, Doris and Amy, Gilbert and Hubert. ​Much of his childhood was spent with siblings. 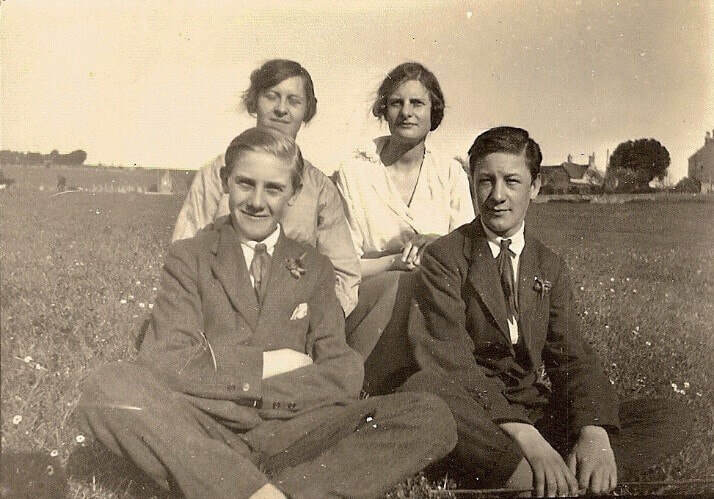 This is four of them sitting on what was Farm Mead field, now called The Rec. 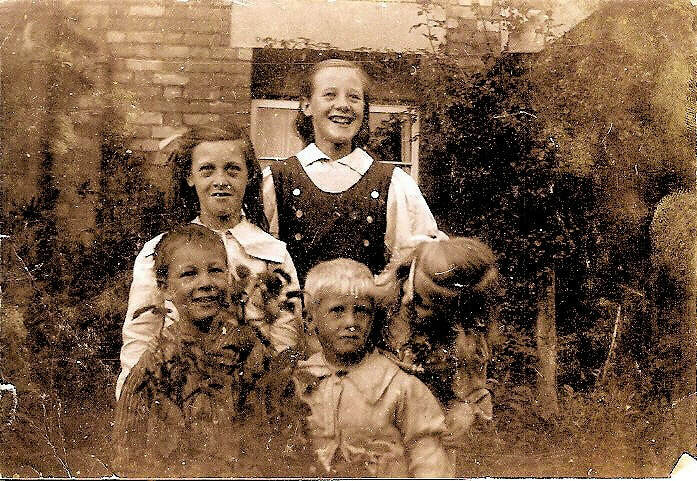 ​Dad is on the left next to Gilbert, with Muriel and Doris behind. ​Hubert was a popular member of the community by all accounts, and had many friends. He took this picture of his mates sitting on Shockerwick Bridge on the way to Bath. 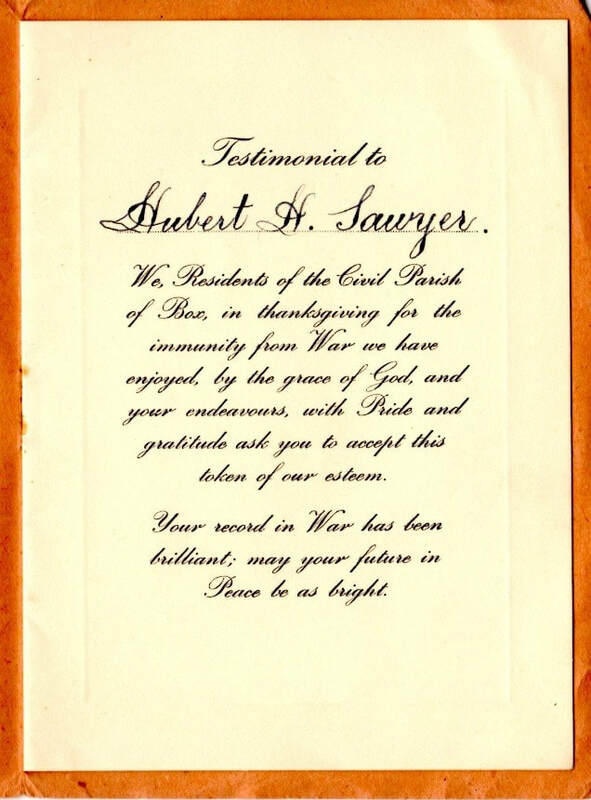 He followed in the family tradition of building, initially with his father and brother Gilbert as F Sawyer and Sons, and then independently, working for various companies. This is one of his projects, building houses in Southstoke in 1934 where he is seen seated in the second row, third from the left. In 1951 he was involved in the building of Bargates. ​He was commissioned into the army in 1943, as a motorcycle courier. This a photo of him in Germany with some colleagues (middle-back row), and the certificate he received on his return. 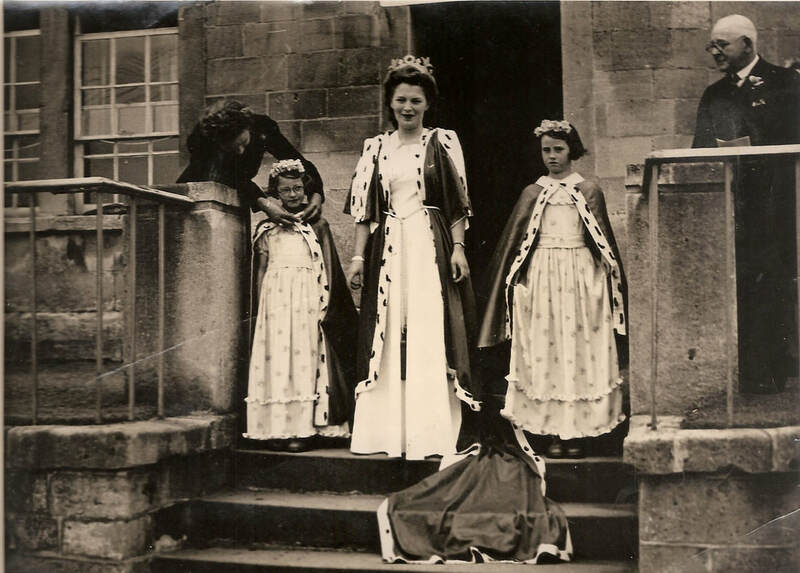 ​On returning from the war, he had divorced from his first wife, Gwendoline Hemmings, and it was possibly seeing Irene Knowles performing her duties as The Queen of Box at the Box Fete in 1946 that attracted him to her, and they married in 1947. They moved to Quarry Hill and had three children - me, Gillian and Barry. ​He was very active and was involved in football in his younger years and later in cricket. 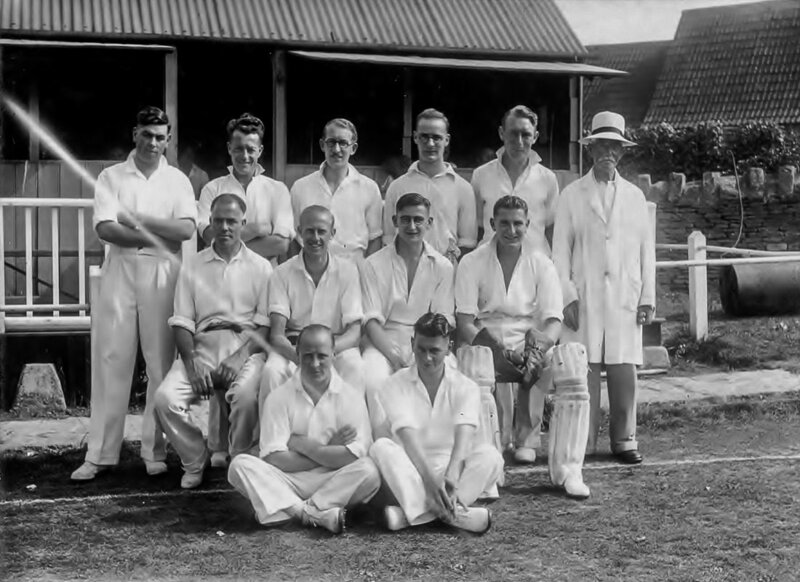 In the book A Century of Village Cricket by Donald Bradfield, he is shown as being Club Captain in 1936-8, and Hon Secretary in 1941, then 1946-56. There is a story in the book about a game in 1936: Bunno Sawyer, as befits a captain, was breaking the hearts of the bowlers with his long smothering reach and neat deflections. He hit a 6 just to show willing, but nearly half his score of 66 was made in singles. He was also a good bowler, being top of the bowling averages between 1951-53, and was awarded the cricket ball in 1952 of the match against Bitton, where he took all 10 wickets for 36 runs. He even became an umpire in his later years. He also took on different roles, such as Secretary of the Box Swimming Club between 1923-39. P Lambert, F Rogers, S Burrows, R Sykes, Ford, ?, H Sawyer, ?, ? 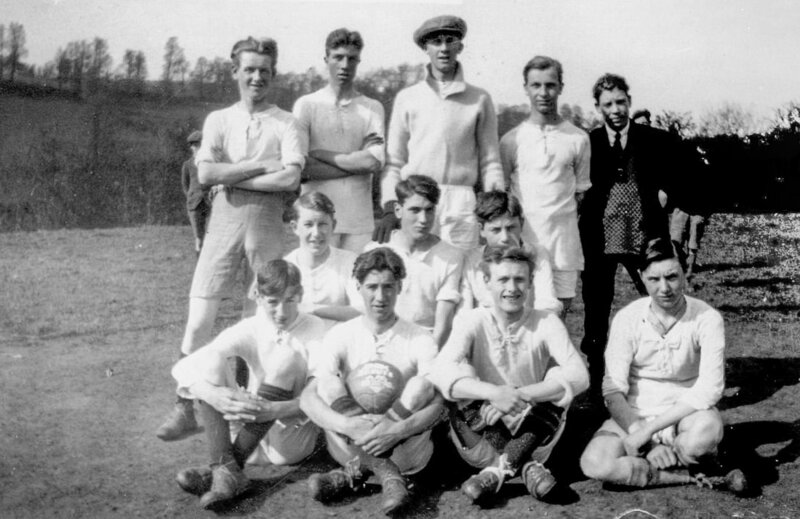 ​Hubert, 2nd left in the middle row. Fourth left in the back row. These are photos from 1948 of him teaching me to ride his motorcycle and me helping Dad to mow the cricket pitch. He was also a member of the Comrades Club, in what was Alpha House, now Hardy House, and met up there frequently for snooker and card games - seen below in later years second from the right. We moved to The Ley in 1954. Mum said it was because she was fed up pushing the pram up the hill! It was certainly easier for us kids to walk to school and back every day! After retirement Dad spent most of his time socialising and in the garden, and even doing building work for family and friends. The Ley, with one of his granddaughters. In 1967 Mum and Dad became grandparents for the first time, and ended up with seven grandchildren. He passed away peacefully and unexpectedly in his sleep in 1985, aged 79, leaving behind Irene who lived on until 2011.